I promise you, oh reader, tonnes of people attended this party and drank a mere one glass each. Stick the word ‘hen’ (bachelorette in US/Aussie speak) in front of ‘party’ and certain ideas spring to mind – mainly the lewd, rude and crude. I appealed to middle sister and she leapt at the challenge of a hen party. It was amazing – fizz featured heavily, baking abounded and laughter lingered long into the following day as my mum, sisters and I recounted all that had happened. 1. Good friends. Obvs! Luckily, I possess witty and interesting chums so that was the easy part. One of the friends whom I met years ago when I moved to a brand new city was generous enough to introduce me to all of her friends so I didn’t need to find any of my own. This excellent tactic of identifying a popular and generous soul and then ingratiating self into that person’s company is one I would advise any of you moving to a new place to adopt. 2. Good bakers. I know a genius baker and she made me my very own Swiss roll, complete with my name on it too. One sister made cheese scones, another Victoria sponge and a friend brought a cupcake bouquet. 3. Silly games. Consequences and charades, namely, and a friend who is an excellent raconteur**. A few glasses of fizz and the hilarity obviously increases ten fold. 4. Prizes. Naff ones. My sisters have small children and therefore any kid’s party needs a prize for each child so no-one feels missed out. Tiger moms may disagree – does competition motivate and create future leaders? – but mum and sisters decided to apply the same principle to my hens and toured charity and pound shops to provide prizes so that every one of us won something. As a result, people won the world’s biggest bra, a Charles and Diana commemorative plate, a bottle of femfresh (ahem!) and a Katie Price face mask (and others). 5. Oh, fizz obviously from the picture above. We sipped decorously. 6. A fine spread of gorgeous grub in general… Some of us**, ahem, maybe did not sip so decorously, but there was a lot of food to soak up the alcohol units (clean eaters, look away now) – quiche, crisps, dips***, chocolate cake, millionaire’s shortbread and pizzas. 8. Wine tasting also involved cheese tasting. A match made in heaven surely…? Aged cheddar, really squidgy brie and a beautiful blue. 9. Family members who are super organised and can email folks, co-ordinate arrangements and arrange games on top of all that. Me, not so – therefore step forward Brenda, Lucy and Sally and take a bow. 10. Good friends, again! Thank you Pam, Julie, Maryanne, Lucy, Jackie, Josie, Morag, Val, Louise, Lorna, Connie, Jacqui, Helen, Astrid – and Karen, sorry you missed it for the snow! *Oh, here I am being snotty about certain elements of a hen party and a willie water pistol did feature in mine. And a small, blow-up male doll with a large appendage. 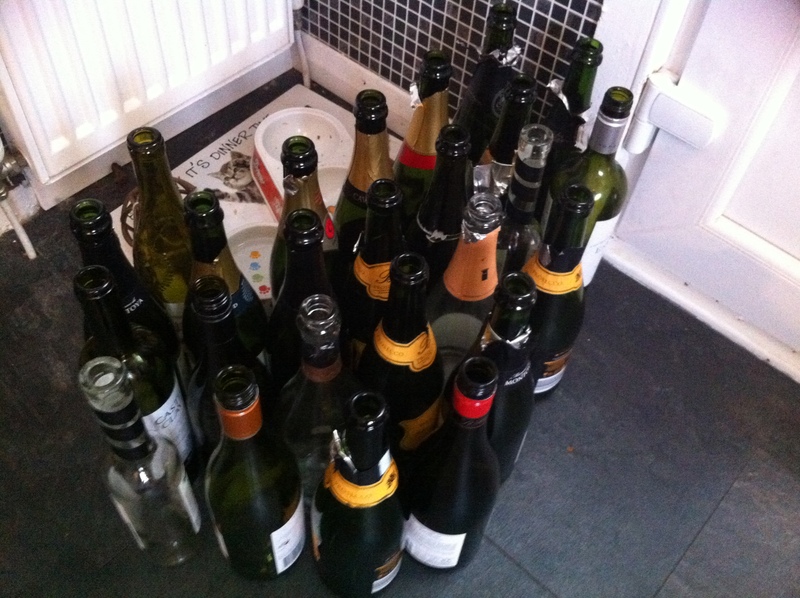 **Erm, the bride to be might have been one of the over-indulgers in all things fizzy and alcoholic. Yum and regrets. ***Anyone else remember that film? Weird Science… so whenever I hear the phrase ‘chips and dips’, I want to say Kelly LeBrock’s immortal lines ‘chips, dips, chains and whips’. ****I was one (ha ha ha) and then the genetic connection was proved – mum and two sisters proved to be also. Now, what can be done with said skill…? Oh, how very kind indeed. I am very, very flattered.